Delhi Agra Jaipur tour gives you an excellent opportunity to explore the busy streets of Delhi, which is jam-packed with a colourful crowd, admire the pink structures of Jaipur andwitness the well preserved historical constructions in Agra! These are some glimpses of the Delhi Agra Jaipur tour. What is known as the Golden Triangle Circuit of India, Delhi, Agra and Jaipur are three tourist destinations that are the most sought after places to explore. On this tour to Delhi, Agra and Jaipur, unwind in the lap of nature along with exploring the cultural heritage of India. Therefore, we bring to you the most alluring attractions that you must catch on your Delhi Agra Jaipur tour. In South Delhi stands tall a minaret, which is the magnificent QutubMinar. A UNESCO world heritage site, the 73-meter high tower marks the achievement of victory. Moreover, make sure to behold a 7 m-high iron pillar that stands in the courtyard of the mosque. They say that if you can encircle it with your hands while standing with your back to it, your wish will come true. 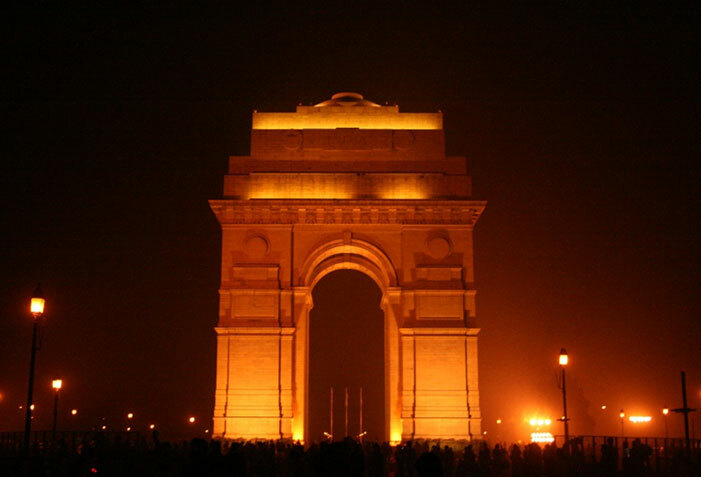 At the centre of New Delhi stands the India Gate. Similar to its French counterparts, it memorizes the death of 70,000 Indian soldiers who lost their lives fighting against the British Army during the World War I. Catch the fountains nearby for they make a lovely display with coloured lights. Another must visit attraction on your Delhi Agra Jaipur tour is the massive Red Fort. Its red sandstone walls are a sight for sore eyes. Make sure to grab a few tourist trinkets at the vaulted arcade of ChattaChowk. Who would not visit the monument of eternal love? The TajMahal is a pure white marble structure that is impossible to see without feeling wonderstruck. Home to one of the 7 wonders of the world, the Delhi Agra Jaipur tourgives you a sneak peek into the architectural history of this city. The sheer expanse of the Mughal culture and art on display will leave you enthralled. Dig into the history of India by visiting the exemplary Agra Fort. Built by Emperor Akbar, it is a massive rampart set on the banks of River Yamuna. Owing to its bedazzling construction and historic importance, the Agra Fort is also a declared UNESCO world heritage site. Lastly, take a one day trip to FatehpurSikri. An example of Akbar’s architectural finesse, the monument here is predominantly made of red sandstone. An 11 km long fortification wall encloses the city, which has various gateways. A paradise for history bugs and photography nerds, this Indo-Islamic Masterpiece is a must visit. On yourDelhi Agra Jaipur tour, you get to visit a palatial wonderland, which is the pink city of India. Jaipur, with its unparalleled beauty, vibrant Rajasthani culture, traditional food, spectacular architecture and regal history serves as a time travel portal. The massive edifice of HawaMahal is a mesh of small windows that paved way for cool wind to enter the palace and keep it cosy during the hot summer months.Thisred and pink sandstone palace’s construction also let the royal women observe the festivities on the streets. The daunting complex of the City palace used to be the seat of the Maharaja of Jaipur. The façade is designed with detailed and acute handiwork. Moreover, it displays a gentle blend of Rajput and Mughal architectural styles. The Amber Fort forms a beautiful reflection across the Maotha Lake while being cradled on the top of the Aravali Hill. Locally referred to as a photographer’s paradise, it is aesthetically crafted out of red sandstone and marble giving it a rustic and mysterious look. So what is it that is keeping you from packing your bags already? OnDelhi Agra Jaipur tour, you will find passion, adventure and most important of all, you will find yourself. Walk into the unforgettable embrace of these mystical cities with us. Book your Delhi Agra Jaipur tour now! Lost in the world of balance sheets as a Chartered Accountant, Namita soon realised that she is not a number person. She always wanted to do something creative in life. She left her corporate job for the passion of writing and took it up as a profession. A freelance writer and editor now, she offers creative blogs and SEO writing services in various niches and sectors. Her love for writing has bagged her with a rich portfolio of working with 200+ international and national clients. She is a writer by choice, a workaholic by attitude and a perfectionist by nature. She is a happy soul and loves everything about life. She believes that ‘writing is the painting of her voice’. We like to provide great package with quality activities what you want to implement in your tour!